One by one I have been tackling the skills an Anglo-Saxon housewife would need to survive on a farm. I learned how to naalbind, before I found three different books stating that Anglo-Saxons did not use naalbinding until after contact with the Norse. This was most distressing to me. First of all it took me a long time to learn to naalbind (several different teachers can attest to that statement.) Secondly linen stockings are uncomfortable! Thirdly non-elastic garters are made by the devil. Just in case you are wondering I do have enough linen stockings to go to Pennsic for two weeks without laundry. And yes, I have found a whole bunch of different colors of yellow from mustard to safety yellow. I have done several different naalbinding projects and they all seem to have a story. When I was learning my mom gave me a lot of turquoise yarn. I was a Baroness at the time and needed a thank you gift for our Baronies officers. I made mittens, a lot of mittens. My friends teased me all fall, when was I going to get that set of mittens finished…I had been working on it for weeks. I cannot read a pattern and I was making up the mitten pattern as I was going along trying for different sizes. What I was really doing was trying to make mates for a huge stack of mittens. 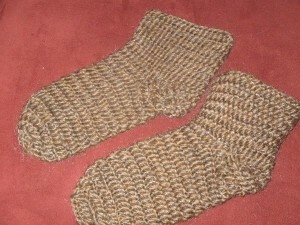 I am not sure if I took a picture of those mittens, but I think I made at least 8 pairs. I made myself a few pairs of socks before I decided that I only want to wear yellow socks. They make me happy and everybody needs a quirk. 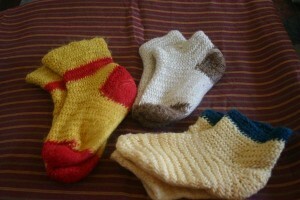 I have worn holes in the bottom of both pairs of yellow socks pictured above and I have patched them. I made my son a pair of mittens on the way to a winter event, because he had left his mittens behind. James of Middle Aston tells that story better, it involves a ball of string and then when we got to the event there were mittens. 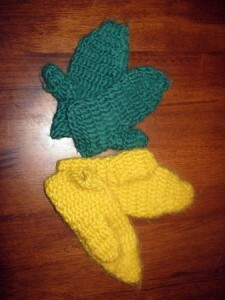 The green mittens belong to my youngest son and the yellow mittens belong to my oldest son. Color coding your children makes it easy to figure out what belongs to whom. Fast forward about a decade and I have an other naalbinding story. I was “paid” $157 per sock to make a pair of socks. I do not like to do commission work, however I love to barter. I bartered for a pair of socks with a blacksmith. I wanted a Viking tripod, turns out Vikings do not use tripods to cook. Well there is an odd tripod from the Oseburg ship buriel, did I want that. I had no idea, he had asked questions about use that I could not answer. Once home I did some quick research on Oseburg tripods on Etsy, I found a reproduction for $314. In the end I chose a trammel chain. It is huge, I love it and I have no idea how to use it. I also found research 2 months later on an Anglo-Saxon tripod from Flixborough, but the deal had been made. I am hoping those socks will wear out, so I can barter again. I think I want some period hinges.